The Disney World bus system makes traveling around Disney seamless and easy for their guests in wheelchairs and ECVs. Here’s what you need to know to use the bus system. If you haven’t read it already, you may want to read the article titled Using the Walt Disney World Bus System. This is the general information on using Disney World’s bus system. Then come back here and read this additional information on wheelchair and ECV use on the buses. 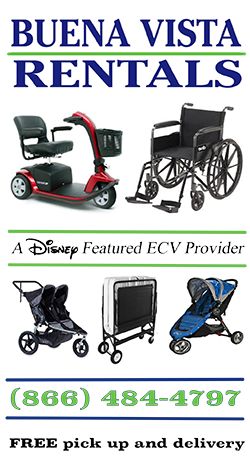 How many wheelchairs & ECVs can the Disney World buses fit? 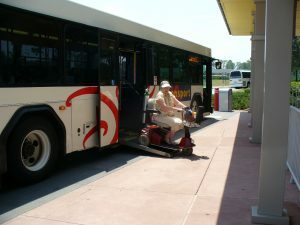 Most Disney World buses accommodate two ECVs or occupied wheelchairs. However there are some that allow for three. At this writing these buses only serve Pop Century, Art of Animation, and Port Orleans Riverside to Magic Kingdom (usually in the morning and at night when Magic Kingdom opens and closes). The bus stops either have a location marked on the ground with a handicap symbol, or they have a sign showing where those in wheelchairs or ECVs should position themselves. This allows the bus driver to spot you upon arriving and puts you in position to load. In some locations we’ve found it difficult to determine where we should wait, so we just waited in a spot that we felt would be visible to the bus driver. The bus driver usually notices you while driving to the stop. However, you may want to wave to the driver to catch his/her attention since they do occasionally miss wheelchair/ECV guests. Depending upon where you’re boarding, there could be a number of buses stopping that go to different destinations. If the bus arriving is the one you want, let the driver know by waving, pointing or whatever will get the driver’s attention. Similarly, if you don’t want that bus, let the driver know in some way – for example, by shaking your head. Wheelchair and ECV guests are the first to be loaded and the last to disembark at their stops. Normally if you arrive in an ECV or wheelchair once boarding has begun, especially if there’s a long line of people getting on, the driver will not board you. He/she will request that you wait for the next bus. However on several occasions we have been boarded after everyone was loaded when the bus wasn’t very full. If you do miss the bus, it’s rarely more than 20 minutes until the next one arrives, and often less. Once they see you, the bus driver must situate the bus to let down a ramp. You’ll board from the side entrance towards the back of the bus. Guests with a folding wheelchair who are able to get out of their wheelchair may also load at the back door, fold the wheelchair and sit on a bus seat. This can be faster because the folded wheelchair is not tied down. It also saves the designated tiedown spots for ECVs and occupied wheelchairs, which are always required to be tied down. For safety, if you’re driving an ECV, set your speed to a slow or turtle mode. It makes parking much safer as you maneuver. In order to let the bus ramp down, you may have to back up since the ramp unfolds out of the bus and onto the ground. When boarding the bus, you’ll ride your vehicle up facing forward. Once at the top of the ramp, take a right. Back up and parallel park as close to the side as possible. If your parking is not perfect, some of the drivers will lift or push the chair into a better position. They might also take the ECV control bar and navigate the chair into place. However, some of the drivers can’t or won’t do that, so you may have to move it onto the proper position while they coach you. It can be challenging since the space is tight, but relax and take the time you need. Once it’s in position, they tie down the chair with some straps. You can speed the process by pre-marking with safe spots to attach the tiedown hooks onto your wheelchair or ECV. In general, safe spots are strong parts of the frame, not flimsy plastic or bolted on. Bright colored tape or ribbons work well for marking. Occasionally guests will be asked to remove items on their ECVs such as bags, back packs, baskets or coolers. This only happens if the items make it difficult for the chair to be placed in the ECV bay. You’ll be able to take those items on board the bus as long as you can hold them. Personally we’ve never had this happen, and my wife’s ECV has a back pack, basket and other bags on it! However the drivers can require this. Check out this video. This lady did a great job. If you need t take a couple of passes at it, it’s okay. You’ll want to get as close to the side as possible. For ECVs, once it’s parked and tied down, it’s recommended that you transfer to a bus seat rather than staying in your wheelchair or ECV. Technically guests are allowed to stay in their ECVs, but keep in mind that no matter how well it’s tied down, the highest amount of weight is toward the top, which makes them unstable, especially if someone is sitting on the seat. This is more of a problem with 3 wheeled scooters. When you board, the bus driver will ask you where you’re getting off. When it’s time to get off the bus, the bus driver will wait for everyone else who’s leaving the bus to get off. Then he/she will come back to you, and remove the tiedown hooks from your chair. He’ll lower the ramp. Then you can then get on your wheelchair/ECV and drive off. Maneuver yourself so that you go down the ramp face forward. Be careful not to turn too soon or you could fall off the ramp, ECV/wheelchair and all. How many people can board with a wheelchair/ECV guest? Guests in wheelchairs/ECVs are permitted to board in the back of the bus with up to 5 other people. If you have more people than that in your party, you’ll be asked to split up and some of your party will be required to board through the front of the bus. The ramp buses have an 800 pound limit for the ECV/wheelchair and the rider. The maximum size allowed on the buses for wheelchairs (electric and manual) and ECVs as defined by the ADA guidelines is 30 inches wide by 48 inches long. This includes objects on your chair such as bags, baskets and backpacks. Disney is following this rule, and they’ve been painting size guides on the ground at the bus stops. You’ll see a painted white handicapped wheelchair symbol inside of a box. 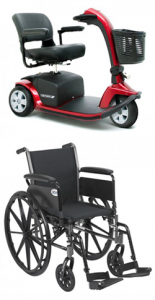 Drive your wheelchair/ECV inside the box with your wheels straight ahead to see if it fits within the guidelines. If not, it’s possible you won’t be permitted to ride the bus. We’ve heard that if your chair is as much as 32 X 48 and fits on the bus lift without forcing, the driver can use discretion and take you. Those in iBOT devices should be able to fit. Guests will be asked to place it in the 4 wheel position for the ride. If you’re renting a scooter/wheelchair from an outside company, discuss the dimensions with your rental company to be sure it will fit within the guidelines. Most mobility scooters were designed to meet the ADA guidelines. Regardless, we recommend that you also ask them for the manufacturer and model number, so that you can look up the dimensions online. It’s a good idea to check for yourself so that you’re not disappointed. If you know you’ll be using a wheelchair/ECV that’s too large for the buses, consider renting an accessible van during your visit.